Bo's story started with my husband and I wanting to get a family dog. We had decided on a Golden Retriever because we had very small children at the time and wanted a dog that would be tolerant of the boys. My husband also had a friend in his growing up years that had a Golden Retriever and he remembered the dog being a "cool dog". So we scanned the local paper and there were several ads for golden puppies in the paper. We looked for one near us and called. The lady was willing to have us come look at puppies the following day. So less than 24 hours after deciding to get a dog we had a 6 week old puppy in our home. I didn't ask any questions about Bo's breeding or about his pedigree or bloodline. I didn't ask about the health of his parents or anything. The lady -- now I hate to call her a breeder -- said that this was her girl's first litter (I don't even know how old she was). And that they had bred to a male who was owned by a friend down the street. The sire's AKC papers had never been sent in, so they were having trouble registering the litter, so she had us pay $75 now and we would pay another $125 when the papers came from AKC. All I could think of was how CUUUUUUUUUUUUTTTTTTTTEEEEEEEEEE the puppies were!!! So here is the story of my $75 "AKC" dog. We took Bo home at 6 weeks old. He'd had his first round of shots. We continued his shots per the Vet's suggestions including giving him rabies at 4 months old and having him neutered at around 4 months old also. Bo was 18 months old when he had his first seizure. It was very traumatic for the whole family. My son was letting him out to go potty first thing in the morning. When he got to the door, Bo was not there with him. He started making his way back to his bedroom and found Bo lying on the floor in the living room. Bo had lost control over both his bladder and bowels. I grabbed the phone and was talking to the vet minutes later. Our vet was around the corner from our house and we had Bo at the clinic and had a blood sample taken less than an hour after the seizure. Many things were ruled out, but it wasn't until several seizures later that epilepsy was diagnosed. Bo was eventually given Phenobarbital (one pill 2 times a day) to help control the seizures. Giving this medication required that Bo have blood work done once or twice a year...Blood work that cost about $85 (not counting the office visit charge). Within 3 years of Bo being diagnosed with epilepsy, Bo was diagnosed with hypothyroidism. Bo now required another pill 2 times a day for the rest of his life. This also required blood work every year, this was different blood work and had a separate charge. I also needed to have Bo on a special diet food to control his weight due to the hypothyroidism. So now, my $75 dog was costing me about $500 per year in medication and blood work to keep him healthy. Bo was about 5 years old when the Vet started noticing a cloudiness to his eyes (cataracts) and at 7 Bo developed a growth on his gum. Talking to the vet, she couldn't tell if the growth was cancer or not unless she did a biopsy. The cost of putting him to sleep, doing the biopsy and evaluation was several hundred dollars. Then we would find out if it was cancer -- which would cost several hundred dollars to remove -- then pray that it was all gone and wouldn't grow back. If it wasn't cancer, it may all have to be removed anyway -- again costing several hundred dollars. Or we would just watch it and make sure it didn't grow too large or too fast. It was a hard decision...but Bo was already a very sick dog. We decided to just wait and see what happened. Several months later, on New Years Eve, Bo started coughing. The next morning, he woke up coughing and he was having trouble breathing. So my sons and I took Bo to the Emergency Vet and had him put to sleep. It was a sad time for all of us. 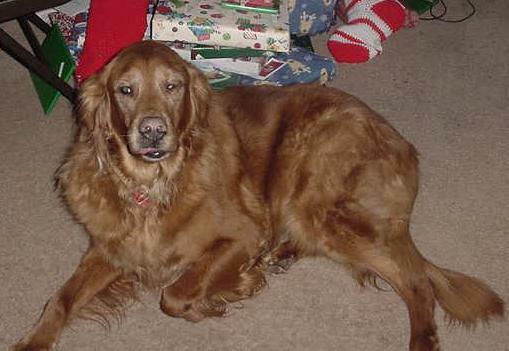 Here is a picture of Bo -- his last Christmas. I just wanted to share my story and experience of buying a puppy from a BACK YARD BREEDER who didn't know about the dogs in her line and just bred any two dogs together. I just wanted to share my story of buying a puppy because the "breeder" lived close by. I just wanted to share my story of buying a puppy that didn't cost much -- but ended up costing more than we could have ever thought...both in $$ per year for medication and vet care and emotional pain and suffering for both our family and for Bo himself. I learned a ton by this experience and I hope you all can learn by reading about it.